When the country girl first lays eyes on the world-traveled flashy man, it’s love at first sight. Here is her dream come true. She envisions an escape from the farm and a life of romance and travel. For him, one look at her and he knows he has finally found a reason to settle down and start a family. Judy Sheer Watters’ delightful memoir shows the hilarity of her city slicker dad trying to learn the small farming lifestyle. Whether you spent your childhood in a huge New York City high-rise apartment complex or on a small farm in Pennsylvania, you will recall your own life lessons in The Road Home. And that’s how it all starts—a city boy from a New York City orphanage well versed in the school of hard knocks meets a country girl who thinks she wants a life of travel and excitement. Together they show how living an honest, but sometimes hilarious life is essential to a happy family. Email me at sheermemoirs@gmail.com for an autographed copy. I thought I’d eat this book like a fast sandwich on a busy day. But I found myself setting other things aside, spending time on Sheer Road with a small passle of kids living the fullness of each day discovering life lessons. This book reads as easy as breathing, with no angst, but filled with the exuberant joy of happy children just growing like Topsy. Their great advantage is a set of well-grounded parents, a father creating a life of quiet adventure, testing himself against the earth, finding his skills to navigate the joys of living. 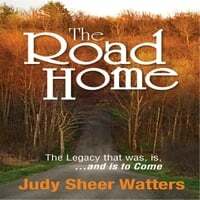 At many points, I shared Judy’s experiences with recognition, marveling at so many similarities to be found in my still under construction memoir. I finished feeling a sense of contentment to share in a time when the world intruded little upon the lives of children. Fine parents, good teachers, wonderful neighbors shaped the lives of children as if everyone has a stake in their nurturing. Don’t neglect the questions at the back of the book. They enhance what is learned and shared in Judy’s story. The book is very well written. The author keeps you engaged and makes you feel as if you are right there with her. I would recommend this to anyone who likes a good, wholesome book to read. It would be nice if everybody could reminisce in writing as Judy has done. I remember Judy and Rodney Sheer, from school but, never realized what a full life they had. Reading about other familiar people and “seeing” them through Judy’s eyes was a pleasure. It was wonderful to read Judy’s experiences growing up in small town American. Her antics with her siblings, cousins, and friends brought tears to my ears along with many laughs. She was able to place the reader in the scene with her as she told the stories. Once you pick up the book you won’t be able to put it down until you read it through. I loved hearing the story of how her father and mother put the chickens above their bed to keep them warm. I could really picture that. I would encourage anyone to read her book and share her life stories along with the lessons she learned along the way. How her father was able to lead his children through situations in their lives and come out feeling better about themselves. Great job Judy. Thank you for sharing. I read this book in one sitting, I couldn’t put it down. I will be re-reading it. The life lessons in this book are poignant today as they were way back when. The courage of Mr. Sheer and his “can do” attitude is so endearing. And the high jinks of the Sheer children will have you laughing out loud and at times bringing a lump in your throat. You will want to share this book with family and friends and not have it sit on your bookshelf. Pack some peanut butter and strawberry jam sandwiches into a paper lunch bag, make a thermos of your favorite Kool-Aid, and invite your best friend to walk with you up Sheer Road. Virginia, Rodney, and Judy will be at the top of the hill, waiting for you to join them in the orchard behind their farmhouse. Nothing fancy today, just a friendly family entertaining their picnic guests with childhood memories that will have you laughing, catching your breath, and wiping away the tears. As you close the book, look once more at the beautiful photograph of Sheer Road, and let it remind you that all of us share the responsibility of keeping our families close in our hearts through the stories we tell, especially those of growing up. I loved this book. I was reading it on a flight to Calgary and I had to put it down because I was about to burst into tears. It is a heartwarming story of success and triumph over adversity. It is filled with wit and wisdom that is lacking in our society today. This is a book for young people who may be overwhelmed with the challenges of modern life. The can-do attitude demonstrated in this book is the answer for digging your way out of whatever rut you are in. Bravo Judy for chronicling the life of a family that wasn’t dysfunctional. In a world where dysfunctional is normal, this book tells an important story. More adults need to put pen to paper and memorialize the heroes that carried their family, and did it with a smile on their faces and spring in their step. This book is a wonderful collection of memories and life lessons. You’ll fall in love with the Sheer family of the fifties.